Rarely, an iPhone, iPad, or iPod touch will become completely unresponsive and errant, leading to what amounts to a frozen device that just won’t do anything. The most obvious indicator of this is when something on screen just cease up completely and the touch screen becomes unresponsive to all input, and clicking on any of the hardware buttons also does nothing. Fortunately you can almost always remedy these unusual situations by forcibly rebooting the iOS device, a low tech solution that works to remedy most of these issues, it only takes a few seconds, and which is really pretty easy. This fairly simple solution is sometimes called a hard reboot or hard reset (not to be confused with an actual factory reset), and it works to resolve the issue in the vast majority of cases, ranging from simple ceased apps, to the weird nonstop vibrating iPhone thing, an endlessly stuck spinning wheel, a completely frozen unresponsive device that’s stuck in an app, an unresponsive touch screen, to many, many other problems. Sometimes, it can even be the solution to a device that seems like won’t turn on as well, so long as such a device is properly charged. This approach works to force restart all iPad models, and most iPhone models including iPhone 6s, iPhone 6s Plus, iPhone 6, iPhone 6 Plus, iPhone 5s, iPhone SE, iPhone 5 and 5c, iPhone 4s and iPhone 4, 3GS, and 3G. Notably, Apple changed the hard reboot process for iPhone 7 Plus and iPhone 7, and also again for hard restarting iPhone 8 and iPhone 8 Plus, as well as iPhone X. If you have a later model iPhone you would need to follow the separate instructions for those devices. Do note that if you find yourself working with an iPhone or iPad with malfunctioning hardware buttons, you can still restart the device using some different tricks here. By the way, this trick works on more than just a stuck iPhone or iPad, and you can usually remedy similar situations on a desktop or laptop by forcing a Mac to reboot too, as detailed here. I’m presuming you meant “seizes up completely” in the first paragraph? I have to do this about once a week on my iPhone Plus. It freezes for no obvious reason, or at least it feels like it does, the screen stops responding to anything. Sometimes if you let it sit there long enough it will get warm and then it will start working after a few minutes, but who has time for that? I think it doesn’t have enough memory to do what it’s trying to do. I don’t see this as a “trick”. It is a troubleshooting procedure. A basic and simple technique that is well known. Yes Homer, it is a troubleshooting procedure for when an iOS device stops responding. You can reboot every iPhone with this, it does not matter what model it is. PEYTON iPhone. Exactly! Thanks for yet another site that states to press the home button and power button. WHAT DO YOU DO WHEN THAT DOESNT WORK?????? My Ipad is black. No power. Dead. Your iPad won’t turn on, that has nothing to do with force reboot. You can’t reboot something that isn’t booted in the first place. First you must turn the iPad on. The iPad must be turned on by powering it on. It must be charged to power on with the Power button. If the iPad has no power, you need to *plug it in and charge the iPad battery* before it will turn on. iPad and iPhone runs on battery power, which is charged by plugging the device into a wall outlet and letting the battery charge. I found this too, I charged it and turned my iPhone on and it worked fine. Leave it plugged in. Maybe you dropped it in the water or broke the iPhone, that’s possible too if you damaged it it will not turn on. Most IOS/OS device users believe restarting their device once and a while is unnecessary. I reboot my devices once a week. It prevents a lot of issues. I do this nearly every day on my IPhone 5.At roughly 30/35% remaining battery capacity the telephone simply shuts down.Apple has solution to this problem with a free battery replacement something which the service center here in Gothenburg will not acknowledge even when my battery is identified by Apple as a problem battery.I need say no more! I had this issue once – could not use an airline app to download boarding pass. After multiple tries, a quick forced reboot as described above fixed the problem. I bought this iPad off eBay and it comes up that is link to a account, I sure hope this isn’t stolen, who can I contact to see if this is stolen? Please help!!! i think i am answering this way too late, but just saw it. More than likely your Ipad was not stolen, it was just linked to an account that was either cancelled or the bill wasnt paid..and the ipad was the victim..so, yeah, its useless pretty much unless you get it unlocked/released/jailbroke.. I purchased an iphone 5c from a military soldier and he did not remove the apple id and icloud id and password so now when the phone automatically updated itself It locked me out because the Soldier is out of the country and I cant locate him. Is there any way to wipe the iphone clean and restart the entire process ? U would have to factory reset.. Thanks so much. Worked immediately. Made my daughter VERY happy. 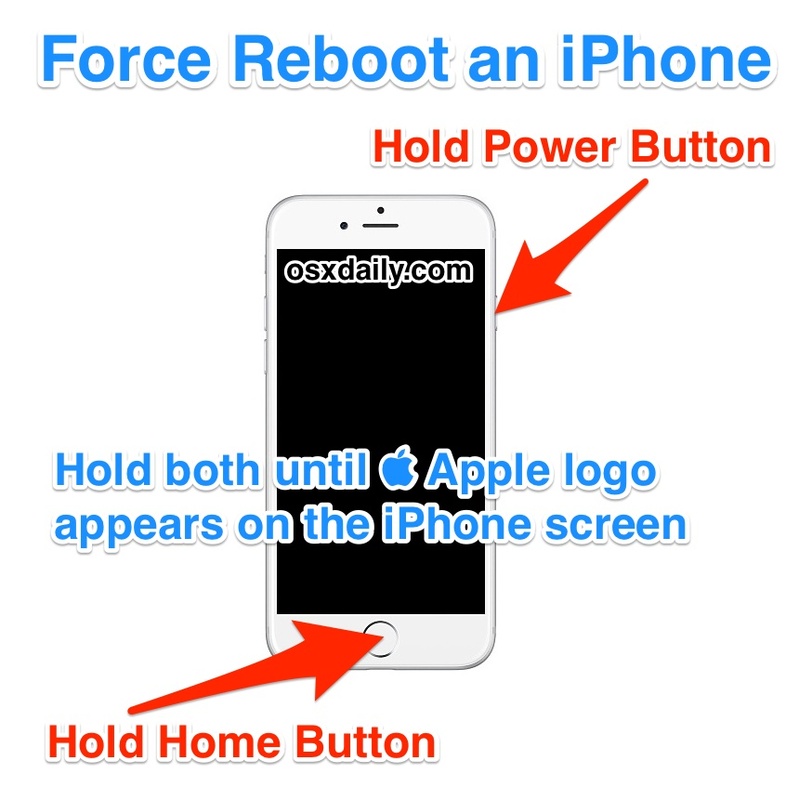 I did a force reboot because my iphone4 would not charge. after the apple pic. now it has a pic of the charger an arrow up and the iTunes circle circle with the music note in it. what do I do now???????????? My I phone 7 was completely dead and as I am overseas I had no chance to take it back to the Apple Store in Melbourne. I tried the trick and it came back no problems. . . . great advice! Sounds good Daniel, enjoy rebooting your iPhone. Thank you very much indeed. It works for me…Apple iPhone 6…. Hello guys, I need your help. I have an iPhone5c and it doesn’t turn on, no matter how hard I press the power button with home button. And every time I plug it to charge the Apple Logo appears and followed by a black screen then the Apple Logo flashes back again. My iphone 5 is stuck on a screen with a narration ‘support.apple.com/….’ , a circle in the middle with a musical symbol, a narration ‘ iTunes’ below the circle and a picture of one end of the cable. My I phone 6s plus using one year old. My phone is after 100% charging while using phone similarly charging down 100% to 70% this is one problem my second problem is suddenly down charging after my mobile off. Next I was hold power botton display is charging low and next hold power botton on my phone that opened after lock immediately off my phone. Hi, I have yahoo cookies stored on my iPhone 6s. I don’t have a yahoo app or an account. I have cookies always blocked unless I choose to manually accept allowing them, and I have tried multiple times to delete them. But no luck. I read about doing a reboot and that should/ will do the trick. I’ve also tried that and still no luck. Does not seem to work with iOS 11 and iPhone 7 (+). You can force reboot any iPhone 7 Plus by holding down the Volume Down button with the Power button until you see the Apple logo. 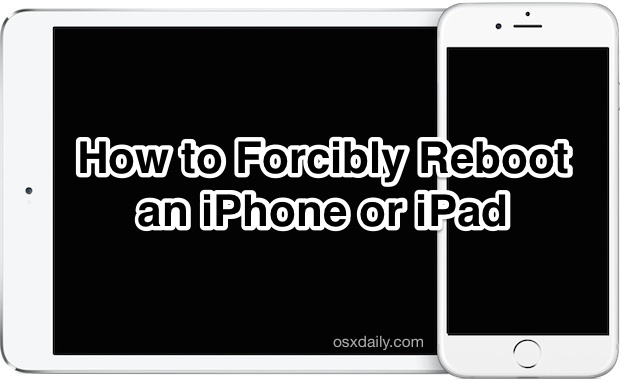 Ashad well here is an article about rebooting an iPhone or iPad, if you need to force reboot your iPhone then you are in the right place. If your phone is turning itself off at 40% your battery might be failing, force rebooting it may not help. Take it to Apple for support. After 12.1.2 ios update unable to access gmail icloud and app store on my 6splus mobile.